M.O.-123 HONORARY DISTINCTIONS - SOUTH AFRICAN CAMPAIGN. Military Order No. 123, 1908, p. 4. Military Order No. 123, 1908, p. 5. Transcription of the data in the order. 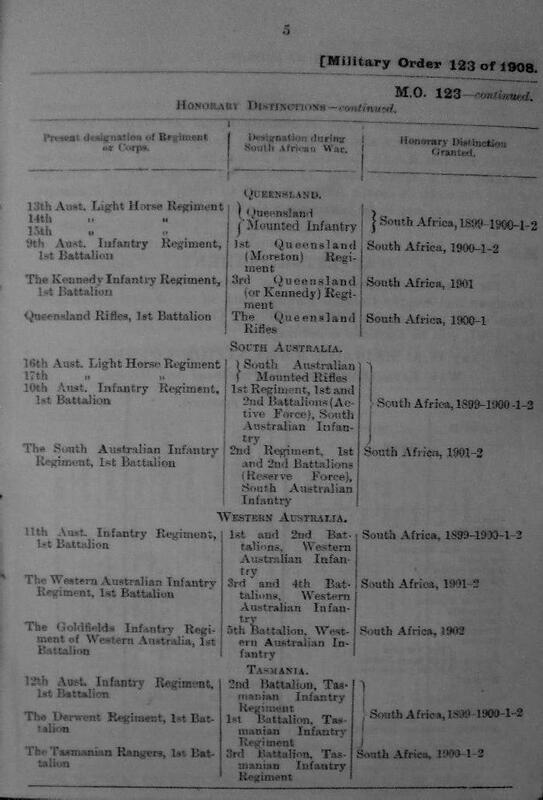 Instructions have also been received that the Banners presented to the Australian Light Horse Regiments, Royal Australian Artillery, the Victorian Rangers, and the Australian Army Medical Corps (GO 258/04) are not King's Colours, but honourable insignia presented by the King as a special mark of favour in recognition of valuable services rendered in South Africa in 1899 to 1902 and that Honorary Distinctions are not to be borne upon these Banners. Military Order No. 123, 1908 was the recognition by King Edward VII of the services rendered by Australian formations during the South African conflict. 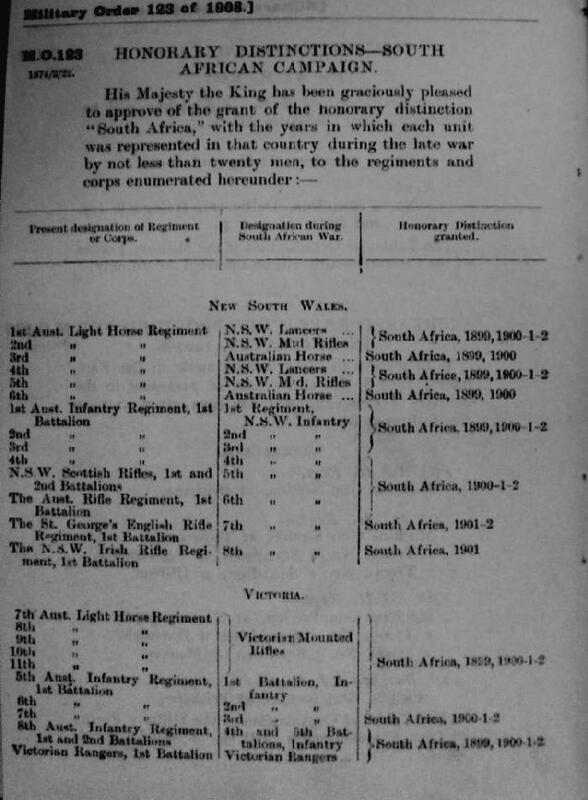 Since the formations to which the Battle Honours were allotted had ceased to exist, the Territorial formation from whence the men emerged, were sustained and to where they went subsequent to the Boer War was the formation to which the Battle Honour was allocated. Military Order No. 123, 1908 formalised the process of Battle Honour allotment to the correct Territorial formation. Military Order No. 108, 1908. Military Order No. 108, 1908, p. 7. Military Order No. 108, 1908, p. 8. This particular order details the designated names of each cadet unit in South Australia prior to the Great War. It is interesting to note the difference in Senior Cadets where they met at various militia depots and Cadet units which were based at a particular high school. 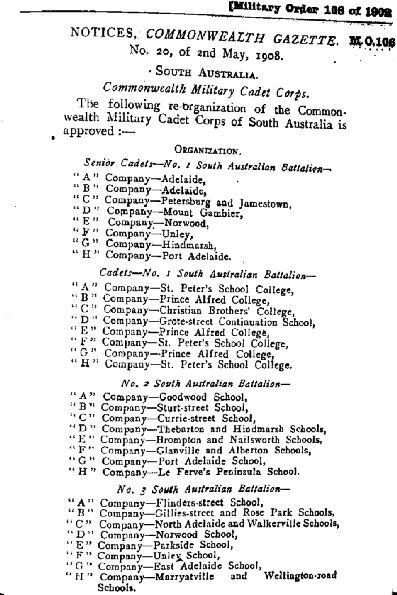 This list also provides an interesting social examination of the high school establishment in South Australia highlighting population centres with sufficient population to allow the formation of a viable cadet unit. 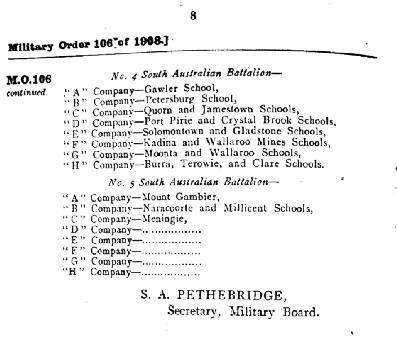 Another social statement was the grouping of South Australian private schools into the 1st Battalion. Citation: Military Order No. 108, 1908. Military Order 151, 1907 deals with the syllabus for an up coming officer training course for 15 carefully selected candidates. Examination of this order relating to the training of officers reveals a great deal about the mindset of military at the time. In 1907 the Civil War in America was still instructive, especially that of Stonewall Jackson. In addition, they are examining the latest information from the Russo-Japanese War. It is interesting that the experience of the Boer War is not taken into account in Officer training, something that did not occur until about 1915 for the Light Horse. For the infantry, it would have been more instructive to look at the consequences of massed cannonades at Gettysburg and Port Arthur on charging troops as well as the importance of entrenchments for the defenders. The romance of war is key to this training course rather than the reality of mechanised warfare. The two men mentioned in this RO both served their nation with distinction during the Great War. Both joined the Light Horse. Sells transferred to the infantry while Siekmann served with the 11th LHR and then the 9th LHR. Here are their brief biographries. Notes Changed name by Deed Poll from Siekmann to Brinkworth, named after the town in South Australia where he grew up. Military Order No. 157, 1909. Below is a copy of Military Order No. 157 which detailed the examination results from the School of Musketry at Hythe in Kent, England. 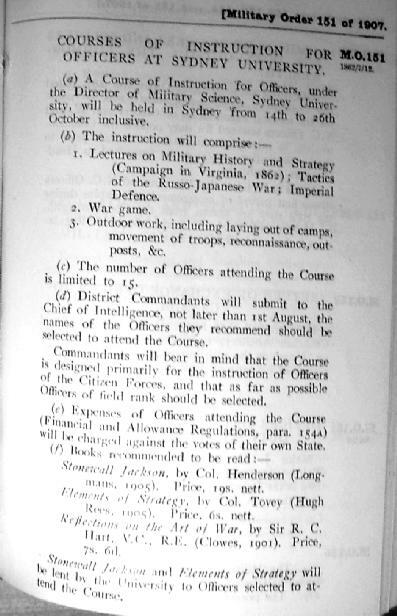 The three men who went to the course passed at different levels as listed in the 1909 Military Order. 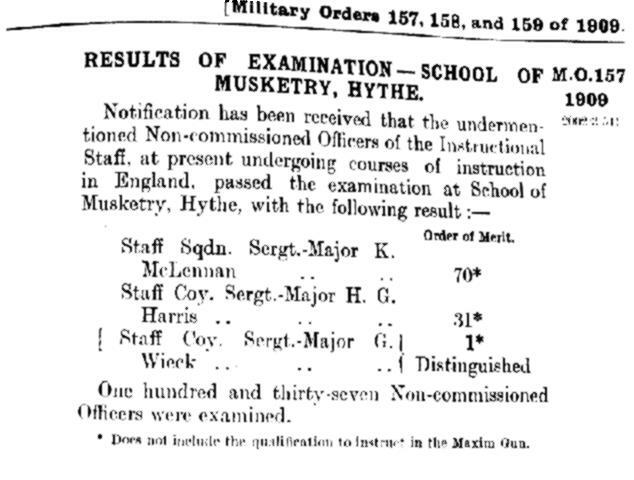 Results of Examination - School of Musketry, Hythe. One hundred and thirty-seven Non-Commissioned Officers were examined. * Does not include the qualification to instruct in teh Maxim Gun. The name that stands out is Staff Company Sergeant Major George Frederick Gardells Wieck who graduated as the top of the class for that particular course. 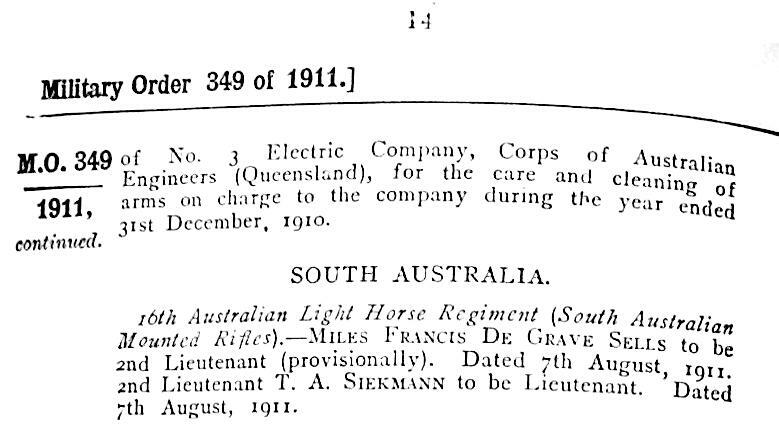 Wieck entered the Great War enrolling as a Captain and appointed adjutant of the 9th Light Horse Regiment in November 1914. His service with the 9th LHR was outstanding and received promotions. He ended the war as a Lieutenant Colonel. At the end of the war, he settled in Western Australia. In 1973, he died at the age of 92.